We focus on building a culture of happiness that inspires our employees and customers to challenge the status quo and allow families to Live Different. At Burkentine Builders, we believe in the power of our people. 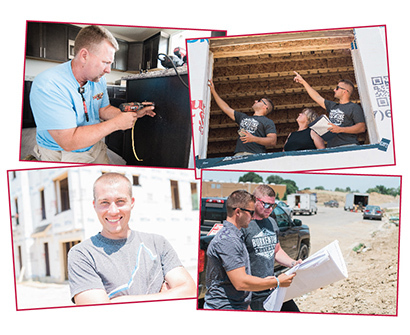 We work hard to ensure our team is comprised of people who share our core values & put our homebuyers & community first. Burkentine believes in a workforce that’s representative of the users we serve. Over the past 30 years, we have focused on growing a business we can all be proud of. Our culture is one of the biggest things we focus on, allowing Burkentine Builders to be one of the best places to work in Southern PA. We continue to grow a professional, dynamic & engaging workplace filled with outstanding employees who are committed to growing themselves & their community. Our team is grateful they are able to have many opportunities to give back to our community. We roll up our sleeves and pay it forward by participating in Toys for Tots, Give Back Drive Gently Used Clothing and Guthrie Memorial Library’s Annual Used Book Sale. Health Insurance: We offer healthcare options for fulltime employees. Vacation & Holidays: We believe our team members need a good work life balance, and as a result, Burkentine offers a paid time off & holiday program. Opportunities For Advancement: Burkentine comprises a team made up of the best people in our industry. We work with all of our team members on opportunities for advancement within our company. Team Activities & Events: We believe in a work hard & play hard mentality. Throughout the year, our team gathers together to celebrate our successes & enjoy team bonding! Working For an Industry Leader: Burkentine is recognized as a leader in the building industry. We are focused on building upon that success as well as our team & community. Competitive Salary: We offer team members competitive salary packages. Work for a company that cares about you and your success! Please download our job application and save to your computer before filling out. Email your application to Kaitlin Burkentine at Kaitlin@burkentine.com to apply for available job openings or call Kaitlin at 717-633-5163.